This individual Report Total Transaction Security: Best Practices in Limiting Fraud Exposure Online and Offline is available for purchase. This Report is available to members of Mercator Advisory Group’s Emerging Technologies Advisory Service. Please be advised that this Report is normally part of a research and advisory service that provides ongoing support throughout the year. As such, this Report contains significant depth of content that is selected for its strategic importance to our members. (For a description of these services, see our Advisory Services section). The push to incorporate FFIEC recommended multifactor authentication systems has created the potential for an industry wide blind spot to the larger problems surrounding fraud prevention in payments. Multifactor authentication is a means of better identifying the user accessing an account, but it cannot prevent the theft of sensitive credentialing information and it does not detect all instances of fraud. New research by Mercator Advisory Group traces the lifecycle of fraud from theft to detection to identify strategies for protecting payment transactions. "In light of recent coverage following the FFIEC's guidance, there is the potential for becoming a little too myopic with regards to multifactor authentication," warns Michael Friedman, Director of Mercator Advisory Group's Emerging Technologies Service and author of this report. "Fraud is not simply the result of a failure to properly authenticate customers, but is instead the product of a number of factors including a failure to control ID credential theft and the occasional inability to detect fraud early in its inception." The report offers four strategies for protecting payment transactions beginning with an analysis of the fraud lifecycle. In ID theft the report identifies the causes of stolen ID credentials via phishing, dumpster diving, screen peeping, or business theft and lost. The report describes technologies and regulations that have been used to control ID Theft and Loss. ID Fraud, the act of committing fraud using false credentials, is discussed, as are the benefits and limitations (i.e. 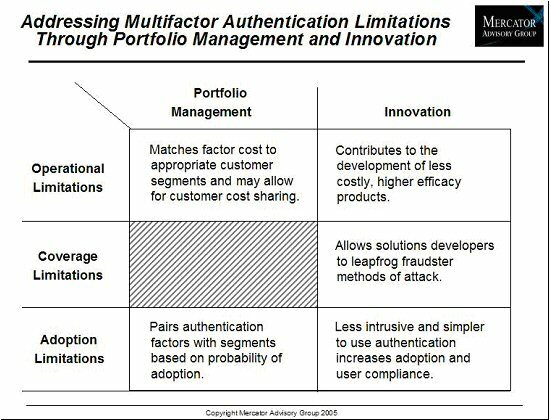 cost, adoption, and coverage) of multifactor authentication. The report also examines the application of transaction monitoring software within the fraud lifecycle as the primary detection tool available to companies today. Transaction monitoring software not only enables organizations to detect rapidly evolving fraud transactions, but also yield revenue-enhancing opportunities. The report is 22 pages and contains 4 exhibits. Members of Mercator Advisory Group have access to these reports as well as the upcoming research for the year ahead, presentations, analyst access and other membership benefits. Please visit us online at www.mercatoradvisorygroup.com.